The importance of Exodus 20 simply cannot be understated. 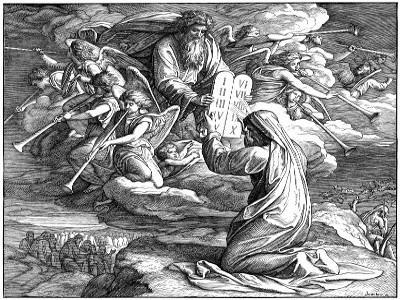 God giving the Ten Commandments to Moses on Sinai forms one of the most basic foundation stones of the Bible. Even the parallel giving of the Commandments in Deuteronomy 5:6-21 is not used as much to discuss the Law of God. While this study will not focus in depth on the commandments themselves, it is helpful to consider the context. God bringing Israel out of Egypt forms the immediate background of the giving of the Law, as Exodus 20:2 makes plain. The Lord performed a mighty miracle by bringing His people out of the “iron furnace, out of Egypt” (Deuteronomy 4:20). “He sent Moses, his servant, and Aaron, whom he had chosen. They performed his signs among them and miracles in the land of Ham” (Psalm 105:26-27). Israel has also passed through the Red Sea on dry ground just two months before (Exodus 14). He gave them water at Marah (Exodus 15:22-25) and manna in the wilderness of Sin (Exodus 16). He gave them water again at Massah and Meribah (Exodus 17:1-7) and delivered Amalek into their hands (Exodus 17:8-16). Again and again, the Lord proves Himself to be faithful and true toward His people, their Savior and Deliverer who gives them all that they need. Israel, unfortunately, already shows signs of her unfaithfulness. They imagined that they would die at the hands of Pharaoh at the Red Sea (Exodus 14:11). They grumbled for water at Marah, Massah, and Meribah (Exodus 15:24; 17:2) and for bread at Sin (Exodus 16:3). 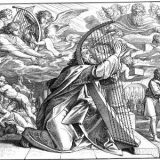 They did not listen to the Lord regarding the manna, treating it as common and not as holy (Exodus 16:27-30). The contrast between the Lord’s faithfulness and His people’s faithlessness could not be greater. This is why it is helpful to speak of the “uses” of the Law as a kind of shorthand. The people recognize their own sinfulness when they hear the voice of God. 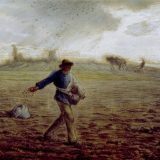 “Now when all the people saw the thunder and the flashes of lightning and the sound of the trumpet and the mountain smoking, the people were afraid and trembled, and they stood far off and said to Moses, ‘You speak to us, and we will listen; but do not let God speak to us, lest we die’” (Exodus 20:18-19). God declares His will to those who have broken His Law, and the depth of that sin is revealed in that moment. “When [Josiah] heard the words of the Book of the Law, he tore his clothes” (2 Kings 22:11). But this revelation of sin does not exhaust the whole purpose of God in giving the Law. Moses says as a reply: “Do not fear, for God has come to test you, that the fear of him may be before you, that you may not sin” (Exodus 20:20). Israel should not be afraid, because God has not come in wrath to reveal His Law. There is a real sense in which we may say that God’s giving of the Law is a sign of His mercy. God prefaces His Law with a declaration of what He has done for His people. He does not choose them because they are faithful; they have shown again and again just how stiff their necks are (cf. Deuteronomy 7:6-8). He does not reveal His Law as something which is unknown; after all, Paul makes abundantly clear that all men know the Law of God in their conscience (Romans 1:18-32). Nor is the Lord somehow obligated to act in this way. Job tried to make God answerable, and it proved to be his sin (Job 40:1-5; also Romans 11:33-36). Rather, God reveals His holy Law to His holy people as a sign of the love and favor He has toward them. “For what great nation is there that has a god so near to it as the Lord our God is to us, whenever we call upon him? And what great nation is there, that has statutes and rules so righteous as all this law that I set before you today?” (Deuteronomy 4:7-8). It is a show of His love and not of His wrath that He reveals His will for His people, because it shows His love for them. Yes, Israel sins and falls away. Yes, Israel does not keep the Law, nor can any sinner keep it perfectly. But those whom Christ has purchased for Himself strive to keep the Law because of what He has done for them. “Lead me in the path of your commandments, for I delight in it” (Psalm 119:35).